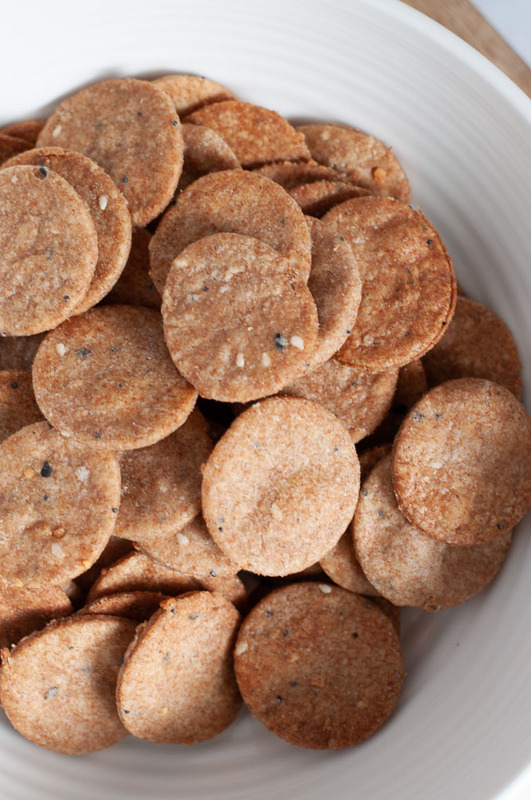 Making your own whole wheat crackers is quick, easy, and requires just four ingredients! Add a little bit of everything bagel seasoning to make these savory crackers full of flavor. This post was originally shared on February 24th, 2018. It has since been updated with new photos and text, but the recipe remains the same! 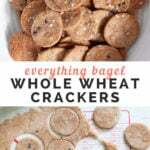 Everything Bagel Whole Wheat Crackers! Everything bagel seasoning seems to be all the rage lately. And for good reason! You can sprinkle a bit of this seasoning on a variety of savory dishes to amp up the flavor: avocado pesto, roasted veggies, vegan mac and cheese. 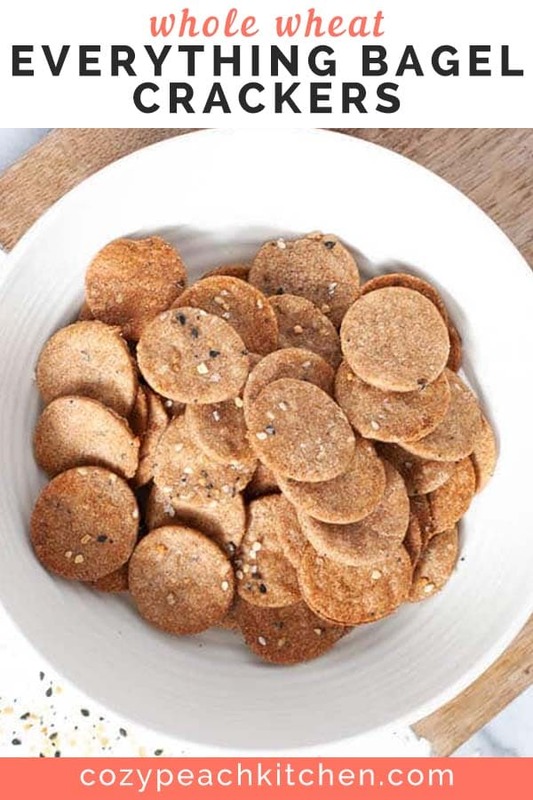 Why not try out the seasoning in whole wheat crackers? You can make your own everything bagel seasoning, or you can check out Trader Joe’s “Everything But the Bagel” seasoning, which is what I used in this recipe. How do you make homemade crackers? You’ll love making homemade crackers, because they’re customizable and surprisingly quick to make. 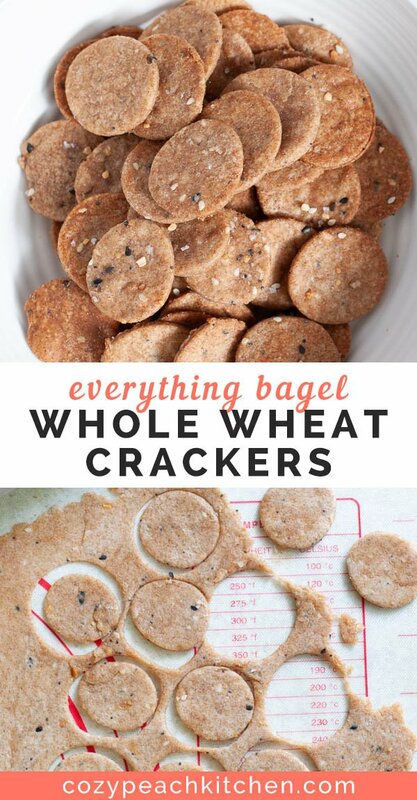 All you need to make these crackers is whole wheat flour, olive oil, ice cold water, and everything bagel seasoning. These crackers are ready in under thirty minutes. Combine the flour, everything bagel seasoning, and oil. Add 1 tablespoon of ice cold water at a time, until a soft dough forms. Roll out the cracker dough onto a baking mat or wax paper until very thin. 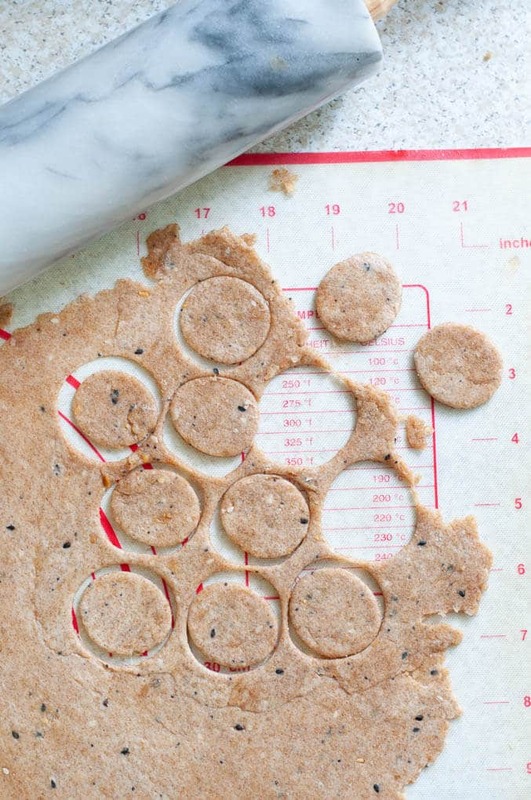 Cut into shapes using a biscuit cutter or pizza cutter. Bake in the oven at 350 degrees Fahrenheit for 15-20 minutes on a large sheet pan. Enjoy! Don’t forget to check out the other healthy crunchy snacks in this month’s Recipe Redux by clicking the link below. 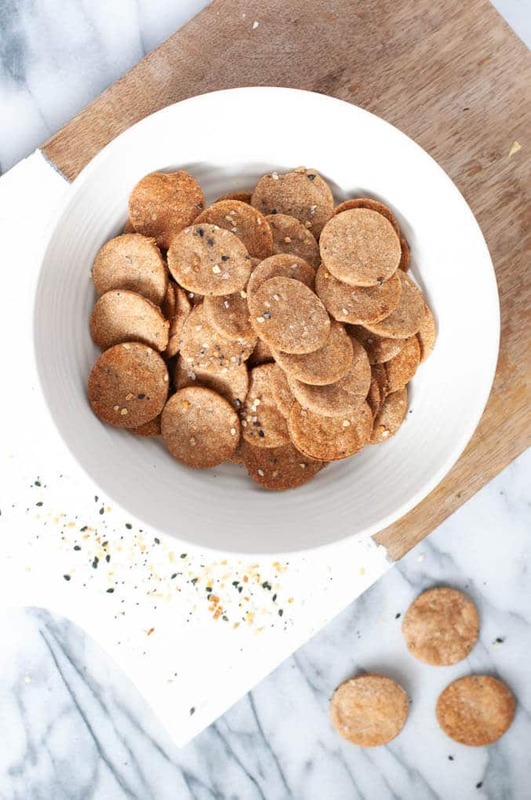 Quick and healthy homemade whole wheat crackers that use everything bagel seasoning. Preheat the oven to 350 degrees. Line a large sheet pan with parchment paper. 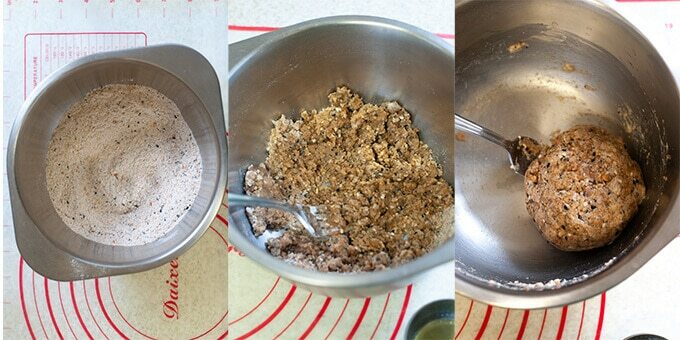 Mix together the flour and everything bagel seasoning in a medium mixing bowl. Pour in extra virgin olive oil, using a fork to combine. The mixture will be crumbly. Add in 1 tablespoon water at a time, mixing with your hands, until a ball forms and holds together. Lightly dust your work surface with flour. Using a rolling pin, roll out dough on a baking mat or between two sheets of wax paper. Roll until dough is a thin sheet. Using small cookie cutters or a pizza cutter to cut into desired shapes. Baking 15 to 20 minutes, or until lightly browned. Smaller crackers will be done more quickly than regular sized crackers- be sure to check on them frequently to avoid burning! Remove from oven and allow to cool on racks. 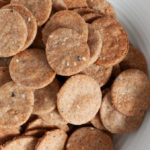 This recipe was adapted from New York Times Cooking "Homemade Whole Grain Crackers". This recipe sounds great, can’t wait to try it. Do you think the dough could be frozen, and then thawed and baked when needed? I feel like this could be a big-batch thing to always have crackers on hand! Hi Louise, I’m glad you want to try it out! I think freezing the dough should work as long as it’s completely thawed before baking. You could even precut your crackers and freeze them that way to save on thawing time. Let me know if you try it out.